Many first-time readers of Jacques Lacan come to his work via psychology, a discipline that Lacan was notoriously antagonistic toward. Six Moments in Lacan takes up the dual challenge of introducing Lacanian psychoanalysis to an audience interested in psychology, while also stressing the fundamental differences between the two disciplines. Punctuated by lively examples, Six Moments in Lacan demonstrates the distinctive value of Lacanian concepts in approaching afresh topics such as communication, identity, otherness and inter-subjectivity. Why is it that each instance of speech implies a listener? Why is the notion of subjectivity inadequate when it comes to the ‘trans-subjective’ nature of language? Is it possible to elaborate a ‘non-psychological’ theory of identification? Why is a Lacanian approach to ‘the subject’ so at odds with models proposed by psychology? Six Moments in Lacan provides an accessible and highly engaging introduction to Lacan and Lacanian psychoanalysis, aimed at early practitioners and students in psychoanalysis, psychotherapy and those studying upper undergraduate and postgraduate level psychology. Derek Hook is an Associate Professor in Psychology at Duquesne University and an Extraordinary Professor in Psychology at the University of Pretoria. A former lecturer at the London School of Economics and Birkbeck College, he is the author of A Critical Psychology of the Postcolonial and (Post)apartheid Conditions. "Where we might expect to find obscurity and aloofness, this book brings us an engaging raconteur, who invites us to consider Lacanian theory through everyday experience. An exciting, unpretentious, and welcome project!"-Dr. Michael Miller, State University of New York, Syracuse, author of Lacanian Psychotherapy. "Hook’s introduction to Lacanian psychoanalysis is unlike any other. It is erudite, entertaining, and it bypasses the twin trappings of dogmatism and theoretical jargon, cutting directly to what is most radical, most useful within Lacan’s Freudian re-theorizations of identity, subjective truth and language. "-Stijn Vanheule, Ghent University, author of The Subject of Psychosis: A Lacanian Perspective. "Gifted with a talent for illuminating even the most impenetrable Lacanian ideas, and alive to the multiple differences between Lacanian psychoanalysis and psychology, Hook opens up new horizons of analysis and exploration for students of psychology and psychoanalysis alike".-Calum Neill, Edinburgh-Napier University, author of Lacanian Ethics and the Assumption of Subjectivity. "The task of making Lacan’s ideas approachable has always been a challenge. 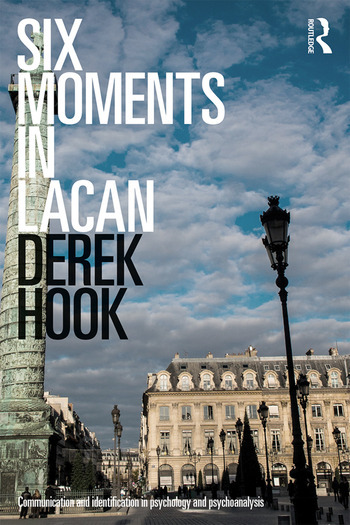 Hook brings his own unique approach to this task, interweaving popular cultural and Lacanian theory in an instructive way. It is via the words of Bill Clinton that we come to understand what ‘the unconscious structured like a language’ might mean; via reference to an episode of E.R. that we come to appreciate how, for Lacan, ‘truth has the structure of fiction’. And it doesn’t end there: it is by means of the makeover show ‘How to look good naked’ that we understand how our own (imaginary) self-image is always mediated by the Other; with reference to colloquial speech (‘Whose your daddy?’) that Lacan’s idea of ‘the Name-of-the-Father’ is brought to life. Hook has developed and refined this material during more than a decade’s worth of teaching…and it shows. "-Stephanie Swales, University of Dallas, author of Perversion: A Lacanian Approach to the Subject.